Last Monday RODOH moderator nexgen586 opened a thread called Here be holonails...or not., in which he presented a link to the article Evidence for the Presence of "Gassed" Jews in the Occupied Eastern Territories, Part 1 by Thomas Kues, which appeared in the "Revisionist" journal Inconvenient History. The accompanying comment of nexgen586 ("I have either been given a link to an exciting cache of newly manufactured holonails for you Manitou or a rather large loose screw. Anyway there may be something worth discussing for you all.") made me curious about whether Thomas Kues had indeed, as this comment suggested he might have, produced something a cut above run-of-the-mill "Revisionist" propaganda. Thus I had a closer look at Kues' article and presented my comments about that article on the aforementioned RODOH thread (posts 12308, 12309, 12310, 12311 and 12312). These posts will be reproduced, with the necessary formatting and minor editing changes, in the present blog and further blogs to follow in the next days. According to mainstream historiography, during a period from December 1941 to the fall of 1944, millions of European Jews were murdered in homicidal gas chambers in six camps in Poland – the “combined concentration and extermination camps” of Auschwitz-Birkenau and Majdanek (Lublin) and the “pure extermination camps” of Chełmno (Kulmhof), Bełżec, Sobibór and Treblinka. Revisionist historians, however, dispute this claim, considering it a theory completely lacking of documentary as well as material proof. Said claim calls for ignoring, first of all, the incriminating eyewitness evidence. Eyewitness testimonies are a source of evidence that "Revisionist" propagandists – one shouldn’t call then historians – apparently don’t acknowledge as such, except when and insofar as they think it serves their arguments. Needless to say, they haven’t yet been able to quote any rules or standards of evidence whereby eyewitness testimonies are not a source of evidence to be taken into consideration. It’s also not like documentary proof of mass murder at Nazi extermination camps were lacking. In fact there is a lot of documentary evidence in the form of documents that allow for establishing how many people were deported from certain places on certain dates to certain camps, correspondence and train schedules related to such camps that show them to be final destinations for the persons deported there rather than transit stations, as well as a number of documents containing thinly veiled or even explicit references to gassing cellars or gas chambers, to the unbearable stench of corpses emanating from one of these camps and to people being destroyed by transporting them to the same camp, among other more or less transparent indications of what these camps were all about. 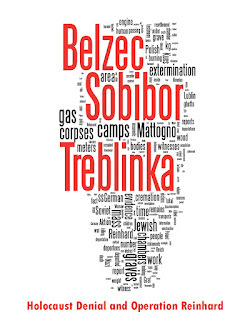 Some of these documents, concerning the camps Chelmno, Belzec, Sobibor and Treblinka, are mentioned in my posts 172, 194 and 777 on the thread Archeological Investigations of Treblinka of the "Vanguard News Network" forum. As concerns physical evidence, not only is it not lacking but reports about it have been provided or acknowledged by "Revisionists" themselves, usually before they indulged in lame attempts to explain away such evidence in a manner consistent with their preconceived notions. Whoever follows this link to articles labeled "graves" on the present blog site will find a wealth of reports, drawings and air or ground photographs of mass graves, including those at the extermination camps Chelmno, Belzec, Sobibor and Treblinka, as well as refutations of "Revisionist" claims and arguments regarding such mass graves. The latest example is the refutation of Mattogno, Graf & Kues’ somewhat-less-than-convincing (and also somewhat-less-than-honest) considerations regarding the Sobibor Mass Graves. In a number of studies, they have shown, based on documentary as well as archeological-forensic and technical evidence, that the alleged homicidal gas chambers in these camps never existed, that the alleged numbers of victims did not perish at these sites, and that there never existed a National-Socialist plan for a systematic physical extermination of the European Jews to begin with. • The refutations, written by members of the Holocaust Controversies blog site, of the Holocaust denial videos about the Aktion Reinhard camps produced by a certain "denierbud": Debunking denierbud videos and writings at http://holocaustdenialvideos.com. As to the "evidence" that "there never existed a National-Socialist plan for a systematic physical extermination of the European Jews to begin with", a case in point are the pathetic claims of a "Revisionist" writing under the pseudonym of "Thomas Dalton", which I have debunked in several recent blogs (Goebbels on liquidation, Thomas Dalton responds to Roberto Muehlenkamp and Andrew Mathis (3), Goebbels on 27 March 1942 – "Dalton" keeps on trying. Besides refuting "Revisionist" arguments, these and other articles clearly show the dishonesty that characterizes the "Revisionist" stance, including but not limited to the distortion or misrepresentation of sources, by quote-mining or otherwise, that "Revisionists" indulge in. Readers of these articles may decide to what extent they are prepared to rely on anything claimed by authors who have been caught in such falsehoods. The revisionists further propose that the Jews sent to the "extermination camps" and allegedly gassed there were in fact deloused and then sent away, the vast majority of them to the occupied eastern territories, so that said camps actually functioned as transit camps. This transit camp hypothesis is in perfect harmony with documented National Socialist Jewish policy as expressed in official and internal reports, documents on the Jewish transports, and even in classified communications between leading SS members. The exterminationists on the other hand are forced to explain away terms such as Durchgangslager (transit camp), Ostwanderung (“wandering to the east”), Umsiedlung (resettlement) and Aussiedlung (emigration) as verbal camouflage. 1. The transit camp Sobibor in the Lublin District is to be converted into a concentration camp. In the concentration camp a processing station for booty ammunition is to be installed. 2. All Higher SS- and Police Commanders are instructed to deliver all booty ammunition to this place, insofar as not needed to operate booty guns in use. 3. Metals and especially the explosive powder are to be used carefully. 4. At the same time a production site for our multiple rocket launchers or also other ammunition is to be set up in this concentration camp. 9.) Sent to the Chief of Security Police and Security Service in carbon copy for his information. According to your above instructions the Sobibor transit camp in the Lublin District is to be converted into a concentration camp. I have talked about this to SS-Gruppenführer Globocnik. We both suggest that you give up the conversion, as the purpose you intend to achieve, that is, to install at Sobibor a processing station for booty ammunition, can also be reached without this conversion. Everything else in your above instruction may remain as it is. I request your agreement, which is of significance only for Gruppenführer Globocnik and me. SS-Obergruppenführer und General der Waffen SS. The Reichsführer-SS agrees with the suggestion made by you and SS-Gruppenführer Globocnik as concerns leaving the Sobibor transit camp in its present state, given that the purpose he intends to achieve can also be achieved in this manner. Why, one wonders, did Himmler propose that the Sobibor camp be converted into a concentration camp in order to install there a station for processing booty ammunition? Obviously because he reasoned that such station required a fairly large labor force and collecting and controlling such fairly large labor force required the kind of organization that characterized the concentration camps run by the SS-Economics and Administration Main Office. Why, on the other hand, did Globocnik and Pohl not consider it necessary to implement such organization? Obviously because Sobibor already had a fairly large labor force, which could be put to the task of processing booty ammunition, and this labor force was being managed and controlled in a manner akin to what was practiced in concentration camps. In fact the camp held about 700 inmates at the time of the revolt on 14 October 1943. There’s no reason why a mere transit camp, a place where people were deloused and bathed and then put back on the train to their final destinations, should have required such a large labor force, which was not much smaller than that of Treblinka Labour Camp. What were all these people, directed in a concentration-camp-like manner by a dozen-or-so SS-men and a hundred-or-so Ukrainian guards, doing in a mere transit camp? To cut a long story short, the fact that Globocnik, Pohl and eventually also Himmler considered Sobibor suitable for installing an ammunition-processing station without any transformation, obviously due to the size of its inmate population, shows that Sobibor was not what it was being called in the above-quoted documents, i.e. not a transit camp. The resettlement actions continue undiminished. The Jews are informed of their fate. Indicative is the statement of a member of the Lwow Jewish council: We all carry our death certificates in our pocket--only the date of death is not yet filled out. Mattogno lamely tries to explain away the above as "a hyperbole relating to the fear and expection[sic!]" of the "potential partial mortality of the Jewish deportees due to the evacuation process". It must have escaped this specialist in text analysis and critique that the OFK is stating that the Jews are informed of what he, the OFK, knows to be their fate, and supports this statement by quoting a statement from a member of the Jewish council whereby the expected fate is certain death, and not just for some but for all future deportees ("we all carry our death certificates in our pocket"). "The Jews know what I know, i.e. that they are all going to die" – that’s the OFK’s statement in a nutshell. Who does Mattogno think he is fooling? The same goes for the complaint raised in October 1942 by the Wehrmacht local commander of Ostrow about the unbearable stench from the corpses of the "not adequately" buried Jews at Treblinka, which apparently carried as far as this gentleman's command post, 20 kilometers away from the camp. See my blog Belzec Mass Graves and Archaeology: My Response to Carlo Mattogno (4,4) on how Mattogno makes a fool of himself trying to explain this stench as having been caused by just 7 to 10 dead per day at the Treblinka labor camp. While the refutation presented by the revisionists alone is enough to make the orthodox “Holocaust“ story collapse like a house of cards, the proponents and defenders of the officially sanctioned exterminationist hypothesis, while doing their best to counter the revisionist onslaught with censorship and various damage control tactics, keep repeating over and over the same question: If the Jews were not gassed, where did they go? First of all, what "refutation presented by revisionists"? The pathetic claims rebutted in the above-mentioned articles, among others, can be called a "refutation" like "Revisionist" propagandists can be called revisionists, and the "collapse like a house of cards" – victory dances of wishful thinkers like TK only emphasize their miserable failure. Second, there is no such thing, at least outside "Revisionist" cloud-cuckoo-land, as the cohesive body of "proponents and defenders of the officially sanctioned exterminationist hypothesis" that TK apparently dreams up. There are governments who forbid and even criminally prosecute "Revisionism" as a form of hate speech, there are other governments who (rightly) consider such censorship incompatible with the basic right of free speech, there is the overwhelming majority of "exterminationist" historians who simply ignore "Revisionist" propaganda, and then there is a handful of dedicated opponents of "Revisionism", mostly private citizens like myself acting on their own initiative, whose deconstruction of "Revisionist" claims and exposure of "Revisionist" falsehoods is not any less devastating because "Revisionists" lamely try to play it down as "damage control", and who wish for nothing better than revocation of all laws against hate speech currently in force, if only so they don’t have to hear the "Revisionist" cry-baby-whining about "censorship" any more. Third, the question what became of the Jews who vanished from the European continent during World War II, if they were not murdered as becomes apparent from all known evidence, is a salutary reminder that "Revisionism" is a moot exercise in haggling over details at best if it cannot offer a solid, evidence-backed alternative explanation as concerns the fate of these Jews. TK's article suggests that he is one of the few "Revisionists" who have (finally!) woken up to this elementary realization. In this sense, TK’s braggadocio may be seen as pep-talk meant to assuage those among his brothers-in-spirit who might otherwise think that he’s wavering in his faith. One might argue that the revisionists have no obligation to answer this question. From a moral standpoint this argument is fully valid. As in a court of law, the exterminationists must prove that the crime they allege really took place – the burden of proof is on the accuser. Actually the accuser’s burden of proof was met by presenting a wealth of eyewitness, documentary, physical and demographic evidence converging towards the conclusion of systematic mass murder on an enormous scale. Then came Hitler’s willing defense attorneys, also known as "Revisionists", and tried to destroy the accusation’s case by discrediting the evidence. So far their attempts have met with disastrous failure, and there’s no reason to assume that this will ever change. Moreover, since the revisionists have proven that the crime – i.e. the mass gassings – did not take place, they have no moral obligation to search for the missing, alleged victim of the fictional crime. As "Revisionists" haven’t proven a thing – though they have tried hard, with pseudo-scientific falsehoods and all – the assumptions on which this conclusion is based do not apply. On the other hand, from a scientific viewpoint the question posed by the exterminationists is also fully valid, even if it usually uttered as a merely rhetorical question and part of anti-revisionist propaganda. Actually the propagandists are on the "Revisionist" side, whereas their opponents ask the mentioned question to remind "Revisionists" of what they must do to have a case that is valid from a scientific viewpoint. Needless to say, the forced deportation of millions of people would leave a significant paper trail. Plus a significant body of eyewitnesses, which is why the yawning absence of either is enough to show how hopelessly hollow the "Revisionist" stance is. Even if one assumes – and there is good reason for it – that the archives in the former Soviet Union and elsewhere which are not under lock and key have been purged of such “inconvenient” documents, common sense dictates that there should exist at least a number of minor direct or indirect documentary traces surviving in more or less obscure and unlikely places where the unnamed custodians of official history have neglected to look. I didn’t know there was a "good reason" for assuming "that the archives in the former Soviet Union and elsewhere which are not under lock and key have been purged" of the documents that "Revisionists" desperately hope to find there, at least outside baseless "Revisionist" conspiracy fantasies. But maybe TK can enlighten us about evidence to such "good reason" that he believes to have come across. In addition, there should exist scores of witness testimonies mentioning the presence of allegedly gassed Jews in the occupied eastern territories, and possibly even physical traces of them. Actually that's an understatement par excellence, considering that we are talking about at least 2,497,000 people who disappeared behind the gates of the Chelmno, Belzec, Sobibor, Treblinka, Lublin-Majdanek and Auschwitz-Birkenau. Take away about half a million Jews who perished at Auschwitz-Birkenau in 1944, at a time when resettlement to the occupied Soviet territories was out of the question already because not much and eventually nothing of those territories was left under German occupation, and we are left with about 2 million people who could theoretically have been transported through these camps to the occupied Soviet territories. Now, if the resettlement of these 2 million people in the occupied eastern territories had actually taken place, one could expect at least hundreds of testimonies from German soldiers or officials involved in the deportation and accommodation procedures, further hundreds from local inhabitants who came into contact with them, and thousands upon thousands of testimonies from among the deportees themselves. What is more, unless we assume (notwithstanding there being no evidence in this direction while all evidence points to Nazi perpetrators) that these 2 million people were killed by the bad Russians in the occupied eastern territories (there is at least one "Revisionist" claiming just that, believe it or not), there would not only be easy-to-trace records of these peoples’ ongoing existence in the home countries to which they returned or other countries to which they emigrated, but there would have been a corresponding number of rightful claimants for indemnity from the Federal German State. Actually the total number of past and present acknowledged claimants for indemnity due to persecution on racial, religious or political grounds (not all of them Jews) was stated to be about 1 million (Constantin Goschler, "Die sogenannte Wiedergutmachung", in: Brigitte Bailer-Galanda, Wolfgang Benz, Wolfgang Neugebauer (editors), Die Auschwitzleugner, Berlin 1996, pages 273 to 296, here page 289. According to this article, two thirds of the about one million persons who had been granted indemnity under the Bundesentschädigungsgesetz, the Federal Indemnification Law, were people who had suffered in ghettos or in camps, whereas the other third were people who had managed to emigrate in time). Such exonerating eyewitnesses would not only have been in abundant supply, but also in high demand by defendants and defense attorneys in those among the NS-crimes trials held before West German courts concerning mass killings at or the deportation to the mentioned camps. (Since 1945, a total of 912 trials were held involving 1875 defendants accused of homicidal crimes committed during World War II in the service of National Socialism. These trials resulted in 14 death sentences, 150 life sentences and 842 timely sentences – see the University of Amsterdam’s Justiz und NS-Verbrechen site >>> West German Trials >>> Introduction.) Perhaps TK can show us a defendant or defense attorney at any of these trials who presented or tried to present such a defense witness, or explain (preferably with something more substantial than hollow conspiracy theories) why none so did. Searching for the "gassed" Jews constitutes part of a new, constructive aspect to the revisionist critique, as the orthodox historiography is not only shown to be flawed, but an alternative reconstruction of events in accordance with known facts is offered (however spotty at this early point in time) – a development of revisionism which Carlo Mattogno has termed "affirmationism". If anything has been shown to be deeply flawed, it is the attempts of "Revisionists" to challenge what they call "orthodox" historiography. The father of the new "affirmationist" trend, Carlo Mattogno, is no exception to the rule, on the contrary. He is one of the HC blog site's favorite "customers" and has been discredited beyond redemption in the blogs labeled "Mattogno", which I presume TK is also familiar with. The present article consists of a comprehensive survey of the hitherto discovered evidence for the presence of “gassed” Jews in the east, and should be regarded as a stepping stone to further future research. 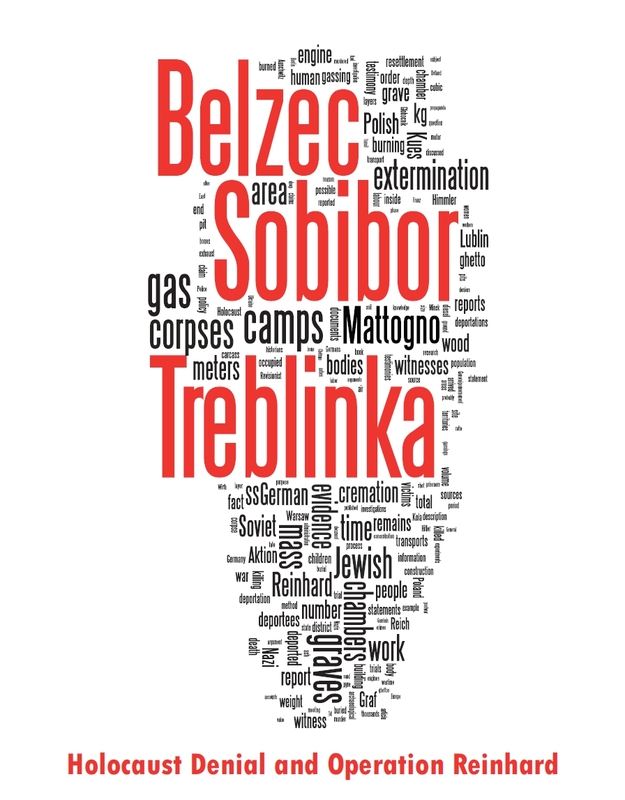 Some of the evidence has already been presented in Jürgen Graf and Carlo Mattogno’s study on the Treblinka camp, as well as in a recent study on the Sobibór camp which I co-authored together with Graf and Mattogno. It should be mentioned here that many pieces of evidence were located by the Spanish revisionist Enrique Aynat and the late Belgian revisionist Jean-Marie Boisdefeu. The majority of the finds presented below, however, are published here for the first time. Let’s see what our friend has got, then. And let’s hope for him that all Jews he located in the "east" are Jews who, according to established historiography, were gassed at Chelmno, Belzec, Sobibor, Treblinka, Lublin-Majdanek or Auschwitz-Birkenau. Otherwise he’ll have invested a lot of work into an at best futile exercise.